Celebrated sister set HAIM are working through a little bit of heartache in the heavily choreographed new video for their highly danceable Days Are Gone pop jam "If I Could Change Your Mind." 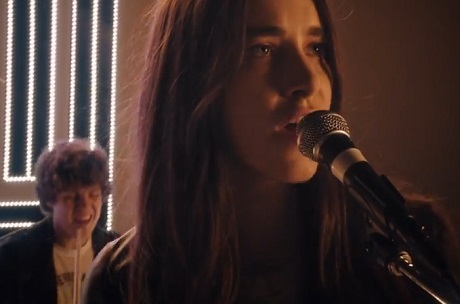 There are a few set-ups in the simple clip, with Danielle Haim generally taking centre stage as she weighs in with nostalgic and yearning vocals aiming to bring a relationship back from the dead. The trio are sometimes obscured by shadows as they jam out the melancholy track, but they're also seen harmonizing and locking into some hip-shaking dance routines in front of a glammy, '70s style TV set replete with a neon-lit band logo. How can such a sad, sad song seem so fun? You'll find out by giving the clip a peep down below.